It is non-invasive. Its seeds are sterile. It does not have running stolons. Propagation is only via cuttings. As such, it will never become invasive. It is non-competitive: Roots grow vertically down. Vetiver does not compete with plants nearby. It is quite safe from pests and disease: It repels pests including white ants. It is hardy and fast growing. It gives quick results. It recovers quickly, even from forest fires. A six-month-old plant will have roots about 5 feet long and a mature plant will have roots about 15 to 20 feet long. It is ideal to effectively control erosion and flood waters. Low-cost vetiver hedges trap silt to form drains. In tea and other plantations, the leafy material can be used as mulch to control weeds and improve water absorption and retention. Vetiver hedge forms a ditch naturally into which sediment collects and does not get washed away like dug out ditches. No maintenance is needed. The bush may be cropped and used as roofing thatch or chopped and spread as mulch. It is a proven beneficial plant. It has proven globally in many projects in many countries around the world. Vetiver has been promoted and supported by the World Bank for many years. We have a Ministry of Disaster Management. It was established in December 2005. We have a Disaster Management Centre too. It was established in 1996 under the Department of Social Services. Dealing with disasters as a specific subject and a serious responsibility of the central government became a reality most probably after the Tsunami of 2004. The public cannot help wonder whether these institutions and their staff are concerned, aware and capable only of post-disaster management and not disaster mitigation if not disaster prevention. Disasters are due to natural events – mostly floods and droughts in the case of Sri Lanka. However, it looks like they have become unusually frequent from about 15 years ago. Almost every year we have had serious floods, earth slips and droughts. What remedial measures have been taken to mitigate at least the damage from floods and earth slips? It is easy to blame climate change for these events but that is not the only cause. Natural events cannot be stopped or avoided. Our citizens and those in power have definitely contributed towards creating disasters by the indiscriminate clearing of mountain slopes for illegal agriculture and ravaged minor and major forests for illicit timber. However, we need not suffer disasters as if it is our fate. We must fight back. It is possible to reduce damage and chances of natural events developing into disasters. It is the almost total lack of this initiative at all levels of authority that has resulted in the public having to face disasters. If the initiative was there the uses and practical application of the versatile plant mentioned below would have been recognised. The authorities, seemingly informed poorly, seem to think that all that needs to be done is to supply food, water, clothing, temporary housing and to make good some small portion of material losses. These are massive scale recurrent expenditures and suffering that can be substantially reduced at a fraction of the cost spent yearly on post-disaster management. All it takes to ensure substantial relief is a simple plant – a type of grass. Its application for the mitigation of floods and earth slips has become a science, a technology and a profession practised in many countries – rich and poor – like the USA, Australia, India, Vietnam, Indonesia and many African and South American countries, adding up to over a hundred. Indonesia has used it in her recovery from the damage of the 2004 tsunami. An international organisation has been created to popularise its use globally. That was about ten years ago. of this plant is grown to extract aromatic oil. We have not even heard of its use in disaster mitigation. If that is the actual situation in Sri Lanka, it is a very poor reflection on the relevant authorities like the Ministry of Disaster Management, the NBRO and many others. It shows ignorance, ineptitude, incompetence and an utter lack of caring regarding their initiatives, duties and responsibilities. The Sri Lankan species is called Savandara in Sinhala and Kuruver in Tamil among many other names. The botanical names in use are Chrysopogon zizanioides and Vetiveria zizanioides. What is recommended is the South Indian variety. It grows much more robustly than other vetiver species. Stabilising waterway and river banks, coastal areas, the plant reduce flood velocities, retaining silt, remediating wastewater. On top is a six-month-old plant and new plants from cuttings. Anchoring by Vetiver is far cheaper, more effective, environmentally compatible and longer lasting than currently used stone and concrete structures. No maintenance is required. Villagers can handle anchoring as shramadana or as a profitable enterprise. It can be cultivated on flat lands. 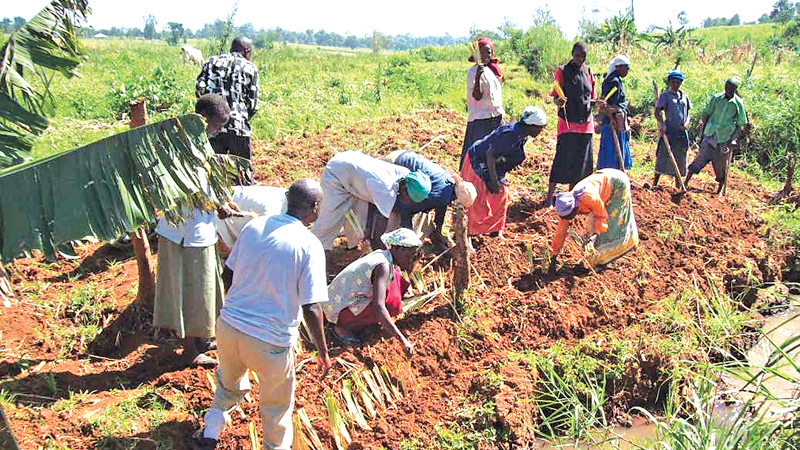 If the land is subject to runoff, erosion of topsoil is prevented by vetiver hedges. Cultivating in the hill, Vetiver hedges replace the conventional ditches along contours. They are cheaper to establish than ditches. They need no maintenance and are permanent - unlike ditches. They do a better job than ditches. They enable safe cultivation of hillsides. These hedges improve soil moisture content too. Most of our people eke out a poor living as rainfed crop subsistence farmers on state land. The only way to improve their living standards is for them to produce food and cash crops on a sustainable basis. That can be done only by preserving the land. Vetiver hedges along contours enable that - stopping runoff and erosion. Rainfall can be predicted to a satisfactory extent – but not the collection and draining of the accumulated water. That has to be studied. It is the accumulated water that becomes a flood. Floodwaters can be guided along pre-planned routes, thereby greatly reducing damage. Even in prosperous countries, people voluntarily erect sandbag barriers to direct flood waters away from important areas. In our country, everybody just waits for the disaster to happen. This is simply unacceptable and criminal neglect. Creating sandbag barriers is tedious, expensive and labour intensive. It cannot be done at the spot or quickly too. Now there is a simple, quick and affordable method to do the same tasks better, at the spot. It can be used to raise riverbanks, block unwanted waterways, prevent inundation of desired areas, create reservoirs of flood waters, break up and divert water flows. They can be used to create 10 – 15 foot high barriers. Taller barriers can be created by stacking them in a stable manner. The Disaster Management Ministry can purchase these and store them safely for use whenever necessary. Controlling floods in this way is cheaper, less damaging and reduces suffering. The preventive material and its installation will cost just a fraction of the money wasted on uncontrolled flood damage now. Vetiver too has proven to be useful in flood control. The bush is tough and firmly anchored. It does not get uprooted and carried away. It survives long periods of submergence. Hedges grown across flood flow routes will slow down and even change the direction of water flow and retain the sediment. The erosion is caused by the wind and by uncontrolled rainwater runoff. Sheet erosion is caused by wind and rainwater and landslides are caused by rainwater. Sheet Erosion is the blowing and washing away of surface soil, mostly the valuable topsoil, into drains, waterways and ultimately rivers. Almost all our rivers are brown with suspended soil. This is an obvious but neglected devastation which must be greatly mitigated if not stopped completely. Our country is being dissolved into the Indian Ocean in terms of tonnes every day!!! Erosion raises riverbeds, increasing the potential for flooding. Erosion fills up reservoirs reducing their water holding capacity – thereby reducing their usefulness in irrigation, power generation and in flood control since they can store less water. The authorities and connected members of the public are duty bound to control this damage. It affects food production, the GNP, foreign exchange reserves and kills the land due to increased use of chemical fertiliser.